So glad you've dropped by for the first day of Christmas in July! It's a little too warm for hot chocolate by the fire, but not too warm for three days of fun Christmas projects. Maybe the thought of Christmas will cool me off a bit - we are having a 100 degree day today! You probably all know by now that Dennis and I (and Lauren when we visit her in Wichita) prowl the antique stores. 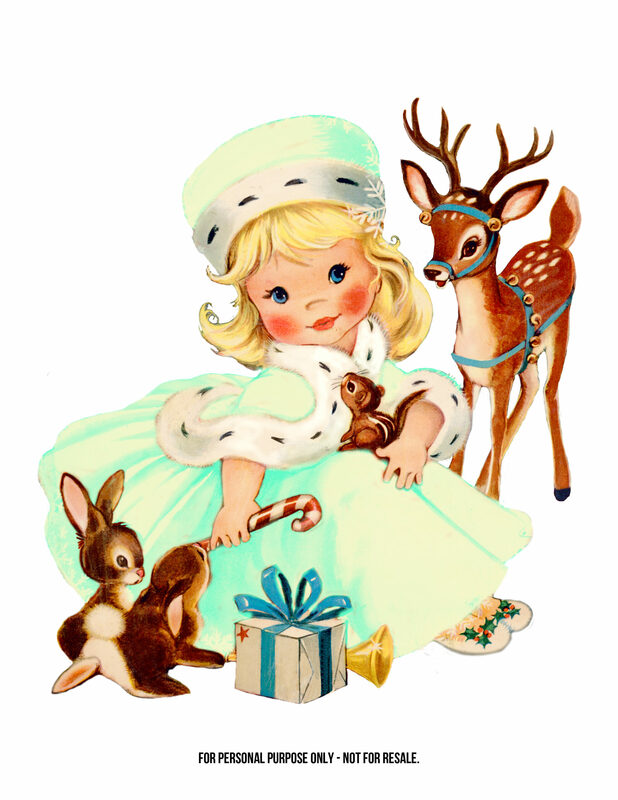 I found a darling HUGE vintage Christmas coloring book with Little Miss Christmas on the cover. I sent her to Keren at Free Pretty Things for You and Keren worked her magic! 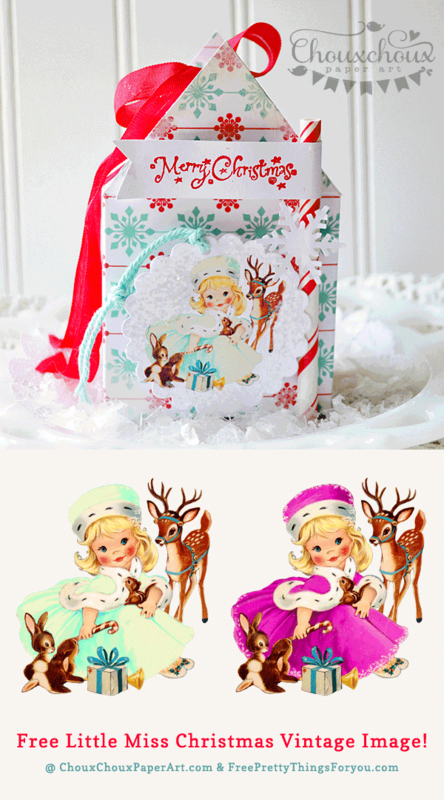 Now we've got three different Little Miss Christmas images. Her dress was originally red and Keren also made her available in white and purple. You can find a link below to download all three. I love the white/blue version and I wanted to put her on a little something other than a card. So, I designed this fun little house just for Little Miss Christmas and her sweet animal friends. 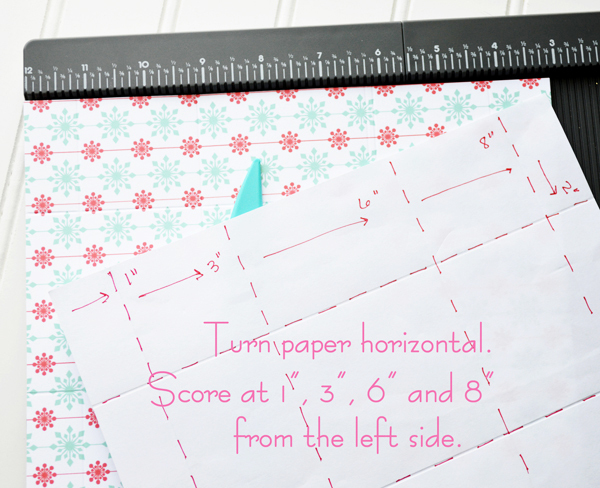 For a house that is 3" across and 2" deep, cut your paper to 7" x 9". Double sided paper would be best. I also used 110 lb paper to make the box really sturdy. 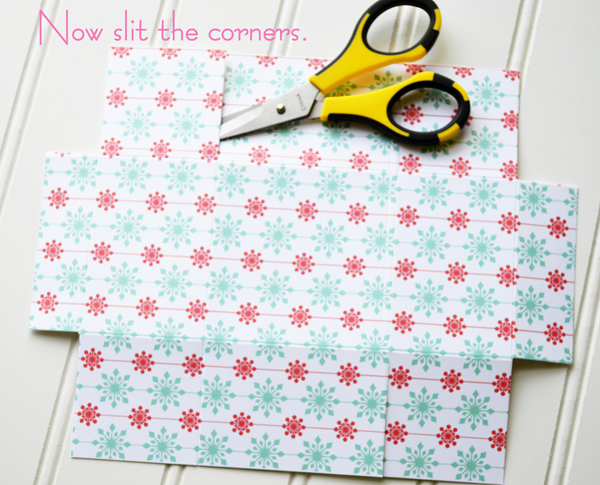 The cute snowflake paper is from Aesthetic Addiction. Now you're ready to score. On the 7" side, score at 2" and 5" from the left side. On the 9" side, make 4 scores. Score at 1", 3", 6" and 8". Cut off the corners and slit the remaining four corners on the long side to the score line. Making the roof peak is next. 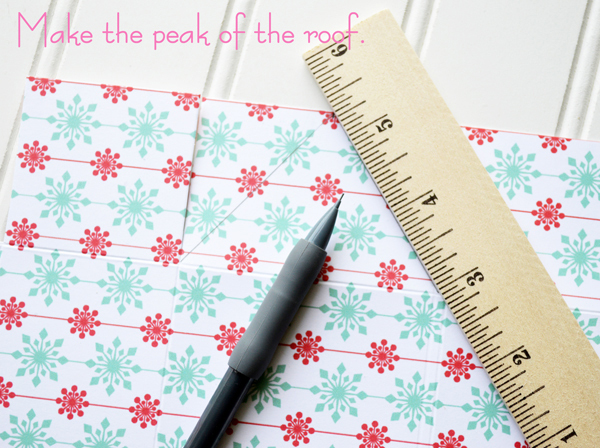 I find it easier to use a ruler and scissors rather than a paper cutter. The center portion on the top will become the peak of the roof. It measures 3". 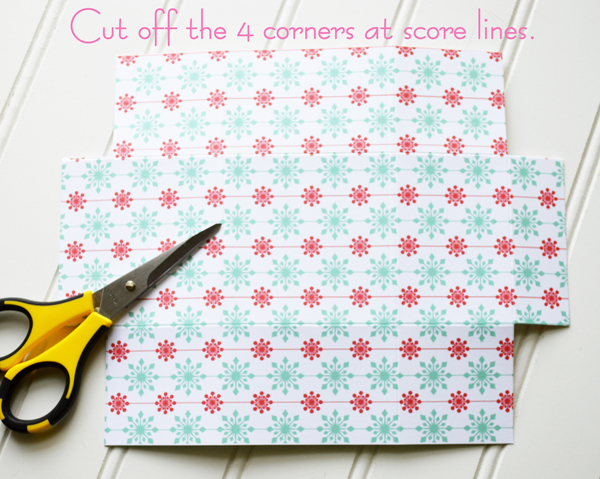 Make a dot in the middle at 1 1/2" and draw diagonal lines to the corners where the scores intersect. 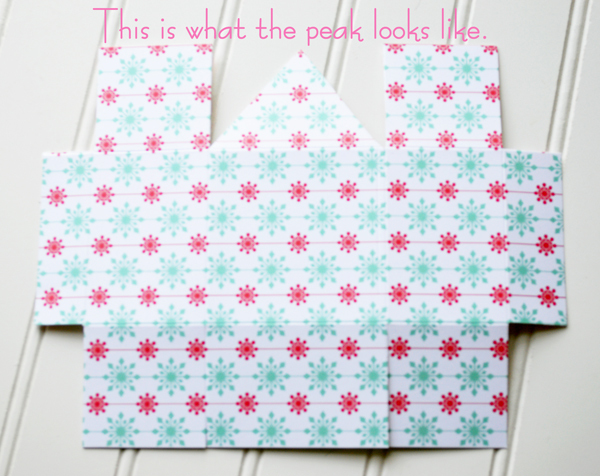 Cut away excess to make the peak. You will also need a back for your house. Cut a piece of paper 3" x 7". Don't forget to score it 2" from the bottom. You will make a peak just like the other. 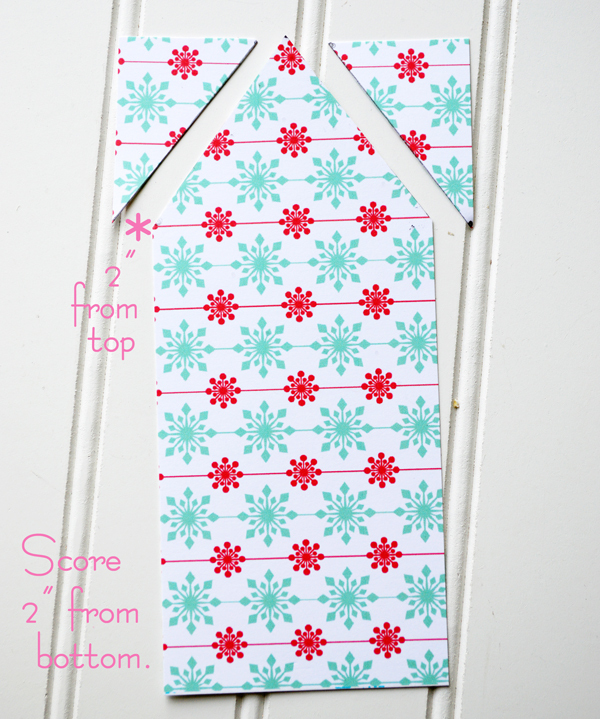 Fold and glue the bottom flaps of the front of the house. The back of the house will wrap around the bottom and be glued to the side tabs. 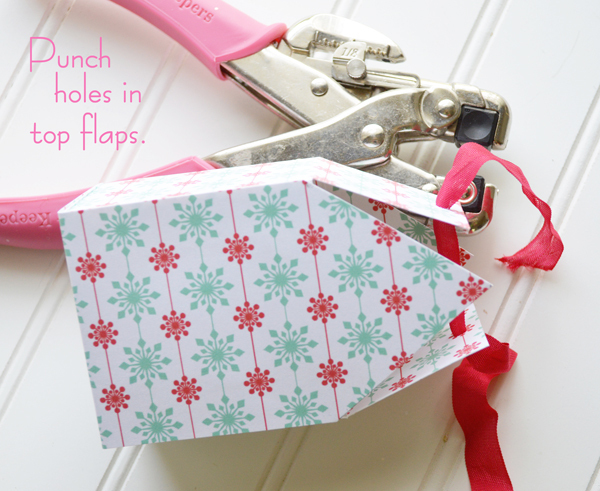 Now you are ready to punch the holes and tie a ribbon to make the closed top of the roof. It really doesn't take very long at all to make. 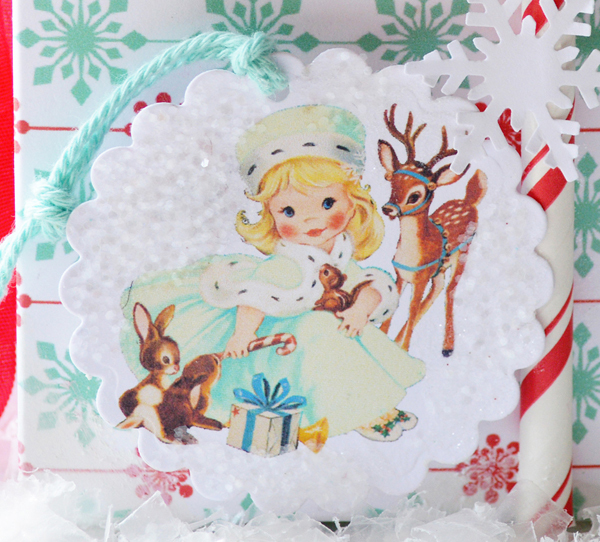 You can decorate with something cute - Little Miss Christmas, perhaps? Download the white/blue Little Miss Christmas HERE. Visit Free Pretty Things for You to download the magenta version. Tomorrow I'll have the link for the red version. There's a cute fox stamp and a set of sentiment stamps. 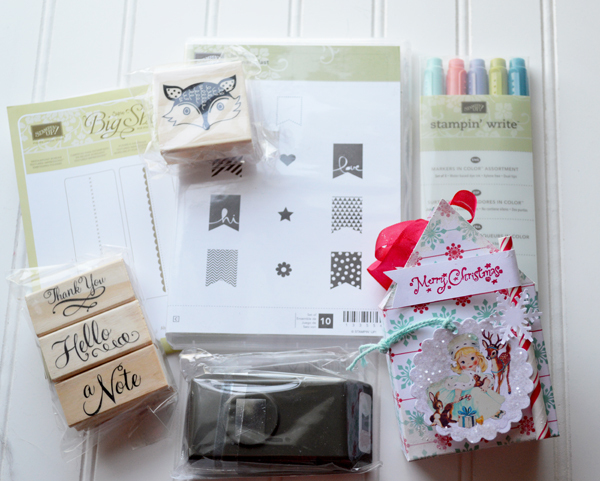 Also some Stampin' Up goodies: Banner Blast stamps, Banner Blast punch, 2 Border embossing folders, and a set of Stampin' Write markers. 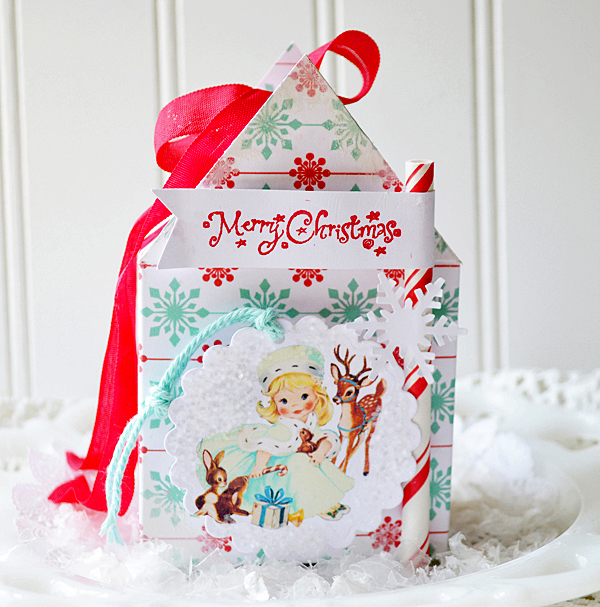 I will also include a KIT for the Little Miss Christmas House. It will come with everything you need except for adhesives. It's easy to win. Just leave me a comment letting me know that you would like to receive my Christmas present. AND come back Tuesday and Wednesday and comment on those posts, too! 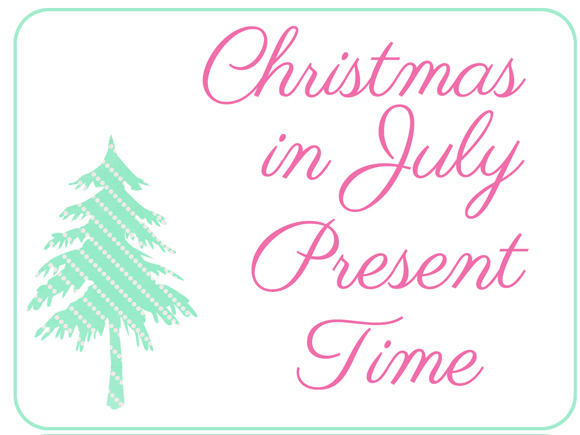 In other words, comment on all three Christmas in July posts. I will announce the winner on Saturday, July 19th. Please comment on all three posts before 11:59 p.m. on Friday. Come back on Saturday to see who won. Especially check back if you don't have a blog and your email address is not on your profile. It makes it a little hard to find you! 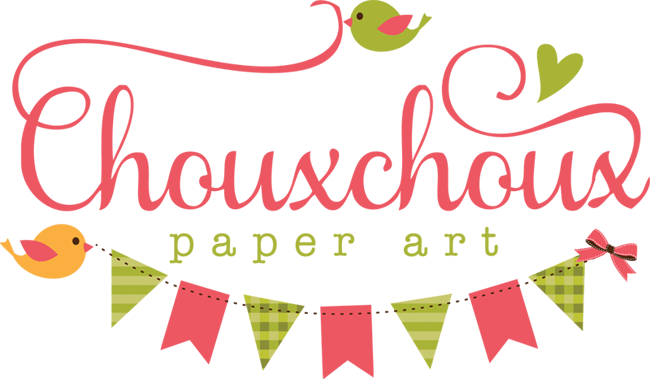 Check out my new Choux Box Kits Club on the page tab at the top of my blog. How sweet! I love browsing antique stores as well. Thank you for the images and house tutorial and I would LOVE a chance to win this prize pkg! This is soooo gorgeous and soooo soooo cute. Thanks so much to both you and Keren for sharing these with us here too and also a big thanks for the tutorial here as well, and finally for the chance to win this great christmaspresent here too, who doesn´t love to get presents??? I know, I sure do ha ha ha. Looking forward to tomorrow to see, what you girls have done there too. Have a wonderful day ahead here now. So vintage and adorable Lori!! 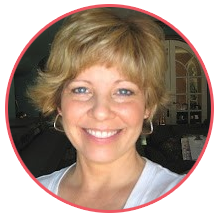 How sweet she is--thanks for the downloads and the house tutorial--so cute. Would love to receive your Christmas present. What a find - Little Miss Christmas is adorable! 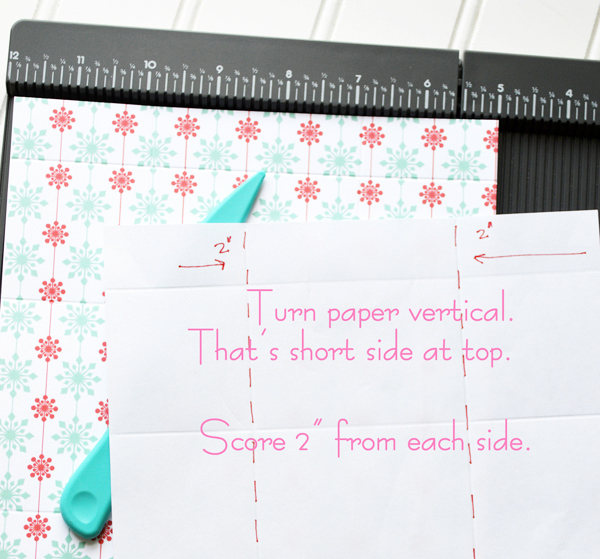 Love what you made with her - thank you for the step-by-step tutorial! And thank you for the freebie and the chance to win your goodies! What a super creation and a fabulous way to use your 'find'. Love all those fabulous goodies and would be thrilled to win them. Thank you for giving us the chance. What a darling July Christmas present and I would be absolutely thrilled to receive it!! I have never used SU Markers so they would be fun to try out. I just love everything you have put together. Thank you so much. Oh I just love this little girl. She is lovely. Thank you for the giveaway. Lori, this is just too adorable! Great step-by-step images for making the house! Your prize package is, as always, so generous! I love the idea of the candy cane Christmas pole! How clever. Thanks for chance to win. I would LOVE to receive your Christmas present!!! I LOVE the candy cane straw. This is so pretty! OMGosh Lori your project is so so sweet. 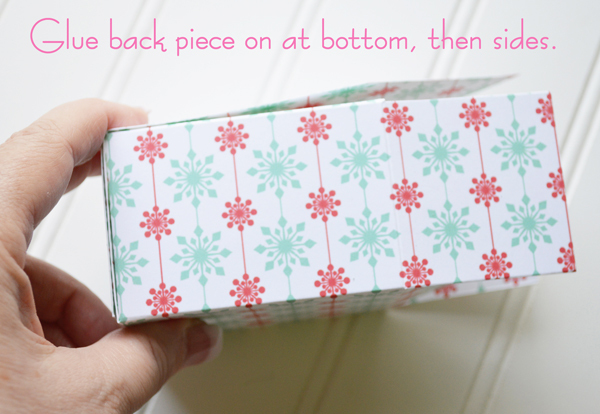 Thankyou for the tutorial.....love your adorable box!